Everyone who knows me knows that I'm obsessed with dogs - any and all dogs, to a point, but more specifically, my dogs. I could look at Ruby's adorable face all day, and since she's on my phone, computer, office bulletin board, and oh yeah, on my arm, I can and do! Boca's antics entertain me endlessly and I have no less than thirty photos of her in my favorite potcake posture, the street dog slouch. I jump at the chance to brag about Ruby's smarts and Boca's sweetness, and pity the unsuspecting person who innocently asks "what kind of dogs do you have?" since Boca's breed/rescue story alone is another tale in itself. I still felt there was potential to level up my passion and Pop Your Pup was the key. I previously reviewed their customized t-shirts and when they approached me for another partnership I gladly agreed. They've changed their look and now offer even more options for proudly wearing the cutest dogs in the world (your own, of course) or turning them into home-gallery-ready works of art in the way of wrapped read canvases! I mean, how awesome are these? Just in case it wasn't clear, this post has been sponsored by Pop Your Pup. 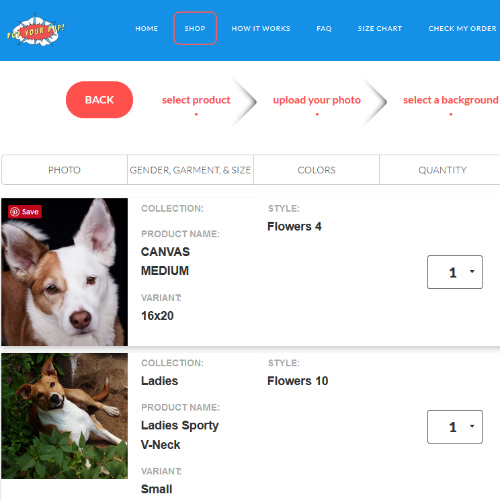 Pop Your Pup's ordering process could not be easier, and it's tons of fun as well. You select your product, upload your photo and choose from a variety of backgrounds - everything from tacos and ice cream cones to vibrant solid colors. I loved the bright cheery colors of the floral background I chose for Ruby's picture, and Boca obviously had to have the tropical blooms as a nod to her Bahamian roots. In just one business day after placing your order, the Pop Your Pup artist team will send you proofs of your designs. If you're not happy for any reason, they can make adjustments or you can start fresh. As you can see, I ended up going with a different picture of Boca after seeing the proof. The first photo is one of my favorites - she's grinning about that nice cool hole she dug in my friend's backyard - but the angle ended up looking funny on the shirt design. I uploaded a different picture (taken by my photographer friend along with the picture I chose of Ruby) and within no time I had a new proof to review. I finalized my order and anxiously awaited the arrival of my new dog nerd swag. You can see that it's a perfect likeness of Boca when she is in a (rare) serious mood. I love that I have a skeptical side-eye potcake shirt to wear! I am a giant dork when it comes to my dogs. I talk to them out loud on walks without a care who hears, my Subaru's bumper is plastered with rescue magnets and I paid extra for that 'Adopt a Shelter Pet' Colorado license plate. My house is pretty much designed around the comfort and well-being of my dogs. I'm thrilled to add this sweet Boca t-shirt and Ruby canvas to my ridiculous repertoire of besottedness. If our fashion choices are a way to express ourselves and our homes are a place to surround ourselves with what's most dear to us, then I think it's fair to say that Pop Your Pup has helped to show my true colors (ginger and white, paws down) and adorn my house with the larger-than-life inquisitive gaze of the dog love of my life. Since Ruby has barked at other canid artwork in the past, I wondered what her reaction to the canvas would be. She didn't bat a white eyelash at it - do you think she recognized herself? This post is sponsored by Pop Your Pup. I am being compensated for helping spread the word about Pop Your Pup's customized pet artwork and wearables, but Rubicon Days only shares information we feel is relevant to our readers. Pop Your Pup is not responsible for the content of this article. Wow, they did a great job! The likeness is perfect for both your dogs. I'm obsessed with the beauty of my dogs too, what Dog Mom isn't? !